It takes about an hour and a half to clean the entire interior. Be careful with water inside the car; if water gets into electrical components, it may cause problems. 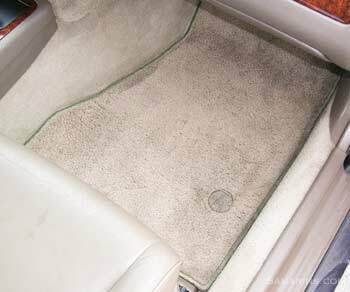 Don't soak the seats too much and don't let water to get under the carpet. It could cause corrosion and damp mouldy smell. 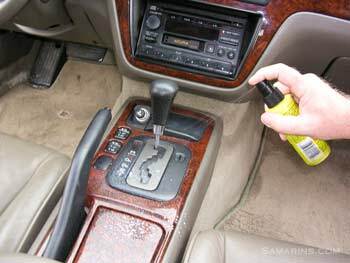 Let the inside of your car dry completely after you done with cleaning. Remove the floor mats. Vacuum the carpet and fabric seats. 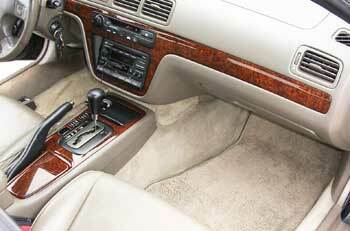 Using the proper attachment, reach under the seats, around the pedals and the area between the front seats and the center console. 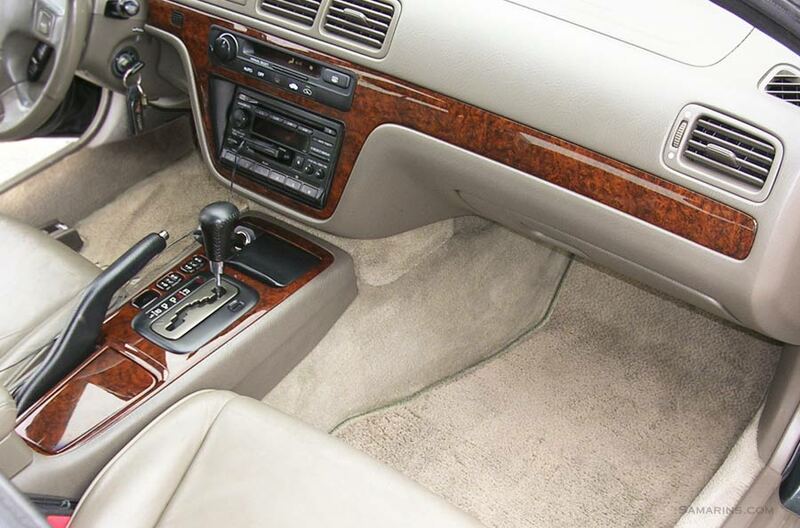 Vacuum floor mats separately. 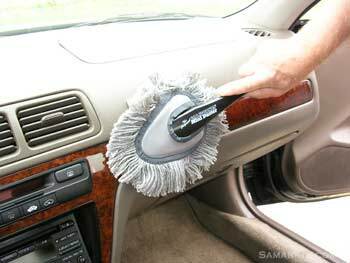 Use a soft brush attachment to vacuum the dashboard, center console and the doors. Be careful not to damage knobs, vents and sticking parts. 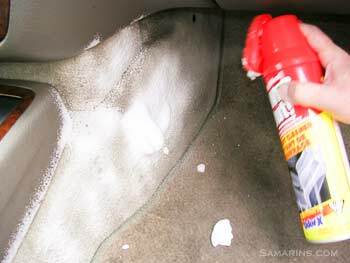 Let's see how we can clean this dirty spot on the rear seat. 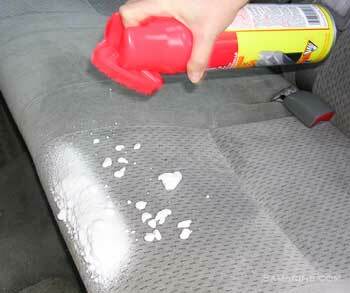 There are number of upholstery cleaning agents available. 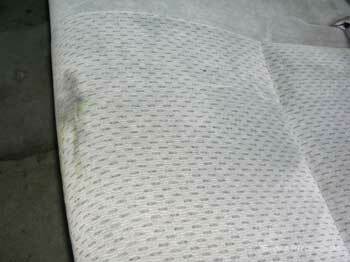 Here we used the Turtle Wax upholstery cleaner, but other products can work as well. The first step, spray the cleaner evenly on the dirty spot. Rub well with a clean cloth. 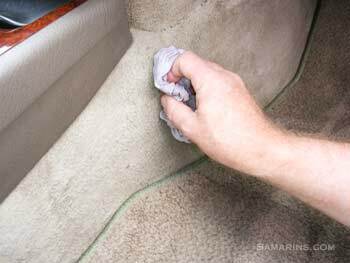 Once the dirty spot is gone, wipe it with a dry soft cloth. You can clean all the seats and door upholstery the same way, working one area at the time. 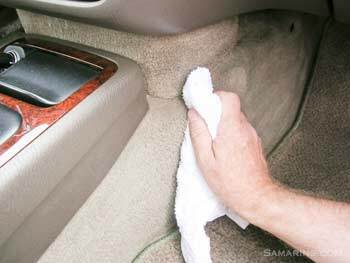 If you don't have a special upholstery cleaner, a regular laundry detergent will work as well: Mix a small amount of the detergent with warm water. Dip a clean cloth into it. Squeeze out well - you want a barely-moist cloth. Work harder on dirty areas. When finished, wipe out well with a clean, soft dry cloth. 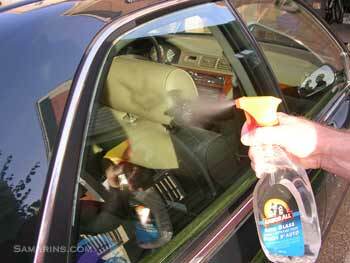 A car leather is very delicate, use a good product specially formulated for leather seats. Some leather care products make the leather more shiny or slippery. Other products can make it sticky or tacky. Before using it, test a product in a small area to see if you like it. 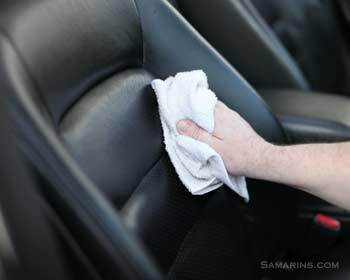 Don't use paper towels on leather, they can leave scratches, use a soft clean cotton towel instead. Be careful with the leather-wrapped steering wheel and shifter knob as some of the leather care products can make them slippery or sticky. It might be a good idea not to use any products on the steering wheel. Instead, clean it with a barely-moist cotton towel. If you use any leather care products on your steering wheel, make sure it is not slippery before you drive. 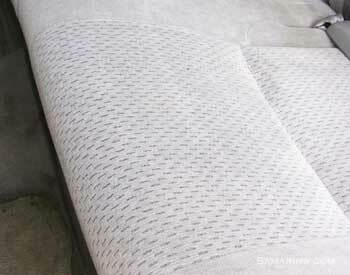 Vacuum leather seat crevices with the soft brush attachment. Be careful, as the vacuum hose can scratch the leather. Spray the leather cleaner on the soft clean cotton towel. Wipe the seat gently, reaching into crevices and around the edges. Here we used a two-in-one leather cleaner/conditioner. 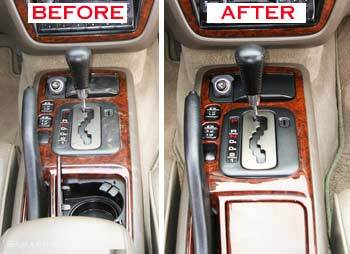 If you use a cleaner only, apply a leather conditioner after. It will protect the leather. 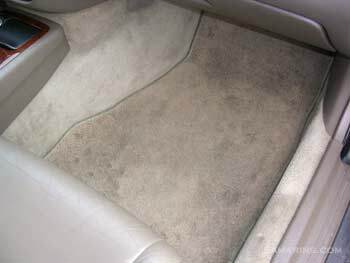 You can clean the carpet the same way you cleaned the fabric seats and upholstery. The laundry detergent solution will work on the carpet as well. Work on one area at the time. Spray the carpet cleaner evenly. Rub well. If your cleaner has a brush on it, you can use it on really dirty areas. When done, wipe it thoroughly with a dry cloth. Don't let water to get under the carpet. Dry it out as fast as you can. 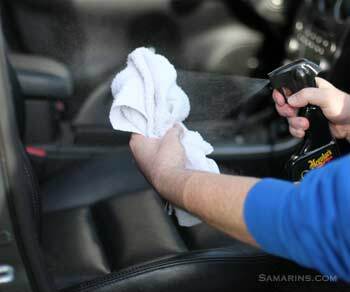 Clean the dashboard, center console and other plastic parts with a barely moist clean cloth. Use a very small amount of laundry detergent to remove the stains. Dry with a clean soft dry cloth. To make it shiny, use a polish for plastic. Spray a little amount of polish. Spread it evenly with a soft brush. 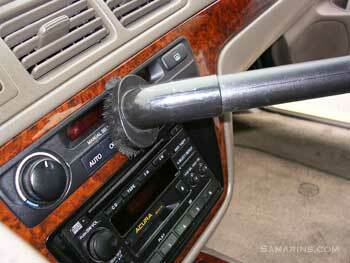 Don't spray directly on the stereo, or other electrical parts, use a brush instead. Buff gently with a clean soft dry cloth. This is how it looked before and after polishing. If you prefer the dashboard and the plastic looking less shiny and more natural, there is a number of products that can do that. Look for Natural Shine polish or plastic protectant. A good polish not only makes the dashboard look clean and shiny, it shields and protects the plastic. 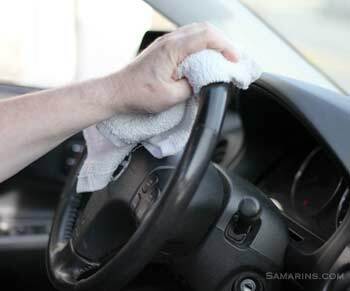 All you need to do after, just use a soft duster periodically and your dashboard will look like new for a long time. Clean all the windows from the inside and outside. A window-cleaning spray and glass-cleaning towel will do the job. Be careful when cleaning the rear window from the inside - the heating lines of the defogger grid are easy to damage. Use parallel to defogger lines motion. Tinted windows also need a gentle touch. The inside of the windshield need a special effort, as any residue will obstruct your visibility. 1. 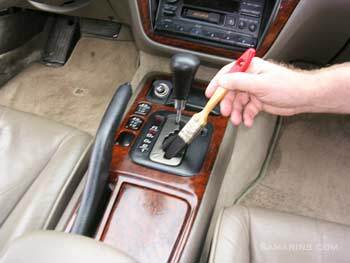 During next oil change, ask your mechanic to check if the A/C drain tube is not clogged up. A mechanic can blow it with compressed air. 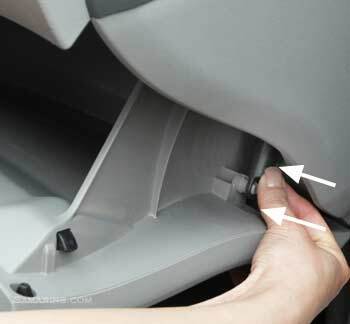 An A/C drain tube is usually located on the passenger side of the firewall. You can find it following water drips under the car when the A/C is running. 2. 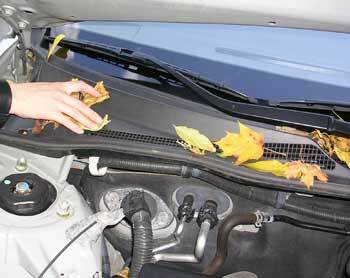 Clean the debris from the cowl panel (under the wipers), as the air intake into the cabin flows through this area. Often a damp smell comes from wet leaves and other debris collected there. 3. 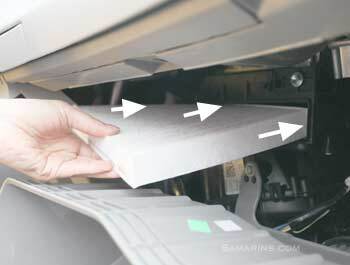 Replace a cabin filter with a charcoal cabin filter. A cabin filter in your car is similar to a furnace filter in your house. 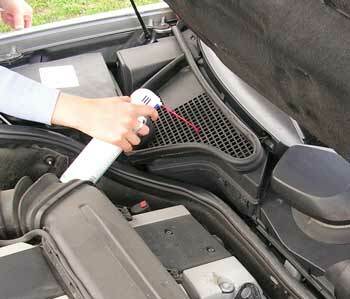 It filters the air for the vehicle heating and air conditioning system. 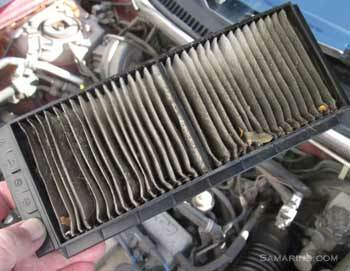 As any other filter, a cabin filter clogs up over time, as you can see in this photo. 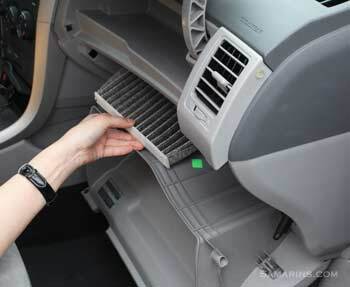 Signs of a dirty cabin air filter include reduced air flow and bad smell from the vents. Dust, pollen and other contaminants trapped in the cabin filter can also cause problems if you or your passengers have allergies. If your car is parked under trees or if you often drive on unpaved roads, your cabin filter clogs up much faster. 4. 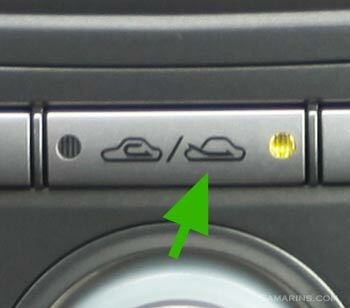 Before parking the car, turn the HVAC mode to "fresh" air. This will allow some fresh air inside the cabin. 5. Once a year or two do the HVAC deodorizing service. Your mechanic can spray a special spray on the HVAC evaporator to kill off the bacteria and fungi living on the evaporator. Here we used the Air Conditioner Treatment from Wynn's that you simply spray into outside air intake vent (check the directions on the product). 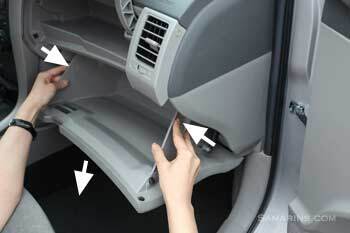 In most cars, the cabin filter is installed behind the glove box. 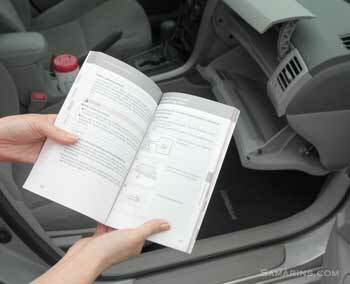 For this car, Toyota provided the instructions in the owner's manual. The first step as per the owner's manual is to turn the engine OFF; of course, we don't need it running. 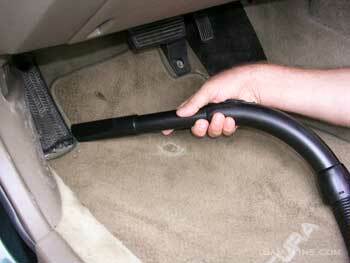 The next step, open the glove box, locate the damper and slide it off. Now, the manual says push in each side of the glove box to disconnect the claws. To pass these claws over the edges, you need to squeeze the glove box gently from each side. The cabin filter in this Toyota is behind the black plastic cover. Pull the cover out and you can see the cabin filter. Pull the old filter out carefully, as it might be filled with leaves and other debris. This one looks dirty. Insert the new filter back. An activated charcoal cabin filter works best on eliminating odors. All we need now, is to install everything back in the reverse order. Make sure install the filter the right way. This manual says The "↑UP" marks shown on the filter should be pointing up. Slide the filter back carefully; check if the cover closes properly. Again, push in each side to make the claws go back in. Lastly, push the damper back into its place. Done. At a dealer, this job typically costs from $30 to $70 for labor plus about $20 for a part. 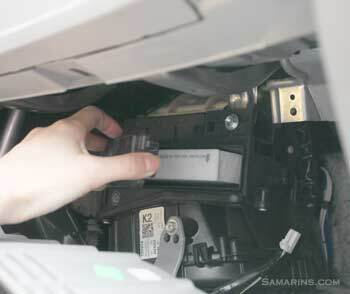 A cabin air filter is recommended to be replaced every 12-24 months or 15,000-25,000 miles.